It rubs me wrong when people have secrets of looking good or saving money and don’t share them. It’s incredibly selfish and tacky. Like when someone asks a skinny model how she stays so thin and the response is like “Oh, I eat whatever I want! And then walk my dogs and meditate!” and they really have a tape worm and starve themselves and work out three hours a day and do meth twice a week. Phonies! If I know about something that’s going to solve your problems, I want to tell you about it. Because 1) I like you, and 2) karma says so. I am painfully picky about cosmetics. Especially foundation. For this reason, I rarely wear it. And then I go out in public and you’re all like [gasp]. I have tried probably hundreds over the years. Realistically, closer to 10 or 15. But while I’d like to have the porcelain skin I once had…I don’t. However, I now find, at my age, that less is still more and this foundation or shall I say "no foundation foundation", is really perfect. It covers just enough without any look at all of being made-up! As much as it wants to be, this is not a "one-color-fits-all" product. That said, however, you absolutely CAN customize this color to match *you*. In order for this to blend seamlessly with my skin tone, I mix just a bit of moisturizer with it and VOILA, it is fantastic! 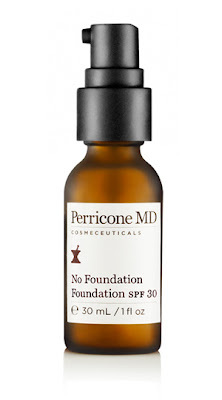 I get the benefits of Perricone skincare, SPF 30, and the perfect color to match my skin. If you have drier skin, be sure to moisturize properly first (Perricone's Face Finishing Moisturizer is a great one!) before applying. As for me, I have extremely oily skin in my 30’s...extremely. By which I mean my face could qualify for OPEC world status. That's how oily I am. Furthermore, I have experienced no breakouts using this product (and I'm pretty prone to them when a formulation does not suit me).